Jainism, like Hinduism, considers itself to be sanatan dharma, the eternal faith, with no beginning (anadi) and no end (ananta). Historians, however, have located its origin to the period that also saw the rise of Buddhism and Upanishadic doctrines related to rebirth, soul, and liberation, which is approximately 2500 years ago, a few centuries before the arrival of Alexander and the rise of the Mauryan Empire. Like Buddhism, it is monastic. Like Buddhism, it does not have the concept of God (param-atma). However, unlike Buddhists, it believes in the concept of an individual soul (jiva-atma), which rises to higher realms when cleansed of all impurities through austerities such as non-violence, abstinence and fasting. Jainism does not have one founder-leader. They believe in 24 great sages, the Tirthankaras, appearing in each of the infinite life-cycles (kalpa) of this world. Besides, Tirthankaras, each era is blessed with 12 great emperors, the Chakravartis, and nine non-violent heroes, the Baladevas, whose violent brothers, the Vasudevas, fight villains, the Prati-Vasudeva. Ram, for the Jains, was a non-violent Baladeva, and Krishna was a violent Vasudeva. This makes Ramayana and Mahabharata as much a part of Jain faith as it is of Hindu faith. In Jain Ramayana, Ayodhya is known as Saket and is home to five Tirthankaras of the current cycle: the first Rishabha-nath, the second Ajita-nath, the fourth Abhinandan-nath, the fifth Sumati-nath, and the 14th Ananta-nath. Of the 24 Tirthankaras, 22 belong to the Ikshavaku dynasty, which is the dynasty of Ram. Ajita-nath’s son Sagara was a Chakravarti, and an ancestor of Ram. - Ramayana is often called Paumacharita, or the legend of Padma, which is the Jain name for Ram. - Dasharatha was once king of Varanasi and later moved to Saket (Ayodhya). - In some versions, Sita was the daughter of Ravana and Mandodari who was found and raised by Janaka. In other versions, Sita has a twin-brother, Bhamandala, who is abducted as an infant, and when he grows up becomes a king who meets, falls in love and tries to abduct Sita, but then turns into a monk when he realises she is his sister. - Ram goes into forest exile as he feels sorry for Kaikeyi whose son wants to become a monk. With Ram leaving the palace, Bharat is forced to stay back and take care of the city and his mother. - Ravana was a Vidyadhara and did not have ten heads. He had a necklace with nine pearls that reflected his head nine times giving the impression he had ten heads. - Vanaras were not monkeys but tribes who had the image of the monkey on their flags. - Ravana is a devotee of Munisuvirat, the 20th Jain Tirthankara. - Lakshman kills Ravana as Ram prefers non-violence. For this act, Lakshman is cast in hell for a long duration. - When Sita steps into the fire to prove her chastity, the fire turns into a lake and she becomes a Jain monk. - Ravana will be reborn in a future era as a Tirthankara. During this future life, Sita will be born as his Ganadhara or chief disciple. The Jain Mahabharata such as Jinasena’s Harivamsa focuses less on the Pandavas and more on the battle between Krishna and Jarasandha. - Krishna’s father, Vasudeva, is a very handsome man whose amorous acts constitute the stories of Vasudevahindi, on the epic of Vasudeva’s wanderings. - Krishna’s mother Devaki gave birth to eight sons. The first six were replaced with the stillborn children of a merchant’s wife. The six brothers of Krishna eventually became Jain monks. The seventh and eighth sons were sent to cowherd families and raised as cowherds. - Krishna’s cousin is the 22nd Tirthankara Neminatha, who becomes a monk as he is unable to bear the sounds of animals brought to be slaughtered for his wedding feast. - In their previous life, the Pandavas were five brothers and they did not stop the wife of the third brother from poisoning a Jain monk, which is why they were born again as brothers and addicted to the vice of gambling. The wife of the third brother was reborn as Draupadi. - Draupadi has only one husband, Arjuna. She treats Yudhishtira and Bhima, who are elder to Arjuna, as her fathers and Nakula and Sahadeva, who are younger to Arjuna, as her sons. The garland she places around Arjuna breaks and a few flowers fall on the other four brothers, leading to the gossip that she is the common wife of all five brothers. - The Pandavas gamble and lose their kingdom to the Kauravas and as part of the agreement spend 12 years in the forest and the 13th in hiding, disguised as servants in the palace of King Virata. Kichaka, who tries to molest Draupadi, is punished by Bhima, who does not kill him. Kichaka becomes a Jain monk and is eventually liberated. - The five Pandavas come to Krishna for help against the 100 Kauravas who have declared war against them. Krishna promises to help them if they help him fight Jarasandha. - During the war against Jarasandha and Kauravas, Jarasandha hurls a wheel at Krishna but Nemi-natha stands in the way, so that the wheel goes around the two cousins, and eventually sits on Krishna’s finger. 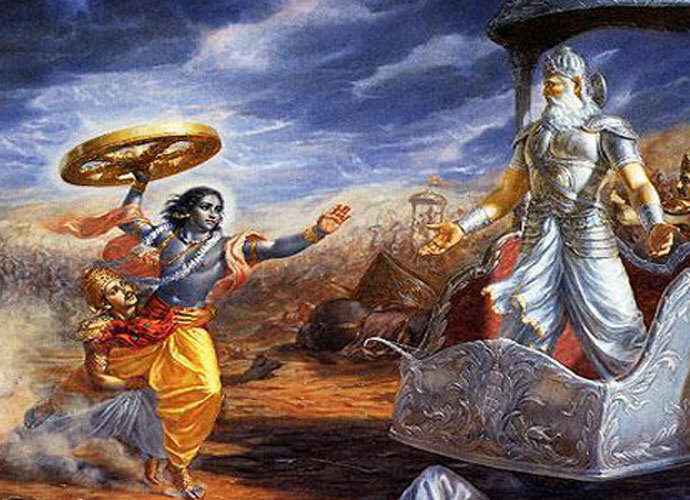 Krishna then hurls the wheel at Jarasandha and kills him. Krishna helps the Pandavas in the defeat of the Kauravas. - After the death of Jarasandha and the defeat of the Kauravas, Krishna is declared Narayana, or Ardha-Chakri. - For causing so much bloodshed, Krishna does not rise to heaven, but experience death, and in a future life will be born as a Tirthankara. Balarama, his brother, stays non-violent. - Pandavas move to the south and establish southern Mathura (Madurai, in Tamil Nadu, which was a popular Jain centre in medieval times) and eventually become Jain monks. - While meditating, Duryodhana’s son Yavrodhana puts hot iron chains around the neck of the Pandavas, burning their bodies, but by then, by the power of meditation, they are so detached from their body that they do not suffer; instead their soul rises to heaven. In some versions, Nakul and Sahadeva are slightly distracted and so their liberation is delayed by a lifetime. - A hunter called Jaratkumar accidentally kills Krishna. Balaram is inconsolable in his grief and refuses to let go of Krishna’s corpse until he sees a man pouring water on a stone hoping it would bloom lotus flowers. He realises his foolishness, cremates Krishna’s body, and becomes a monk. Such is the beauty of his body that a woman rather than tying a rope around her pot tied it around the neck of her son. A king is so terrified by his blazing asceticism that he sends soldiers to kill him but lions materialise from thin air to protect him, which is why Balaram comes to be known as Narasimha. - Kansa does not kill Krishna’s sister Ekanasa but breaks her nose so that she remains a spinster and does not marry a man who can threaten his rule. Ekanasa becomes a Jain nun after some of Balaram’s sons make fun of her for admiring herself in a mirror. In the forest, some hunters see her meditating and are struck by her beauty and conclude she is a goddess. They offer her fruits and flowers. When they return they find a pool of blood. Unknown to them, Ekanasa has been attacked and killed by a lion whose bite she bears stoically as she had outgrown all attachment to her body. The hunters assumed that the goddess preferred to eat animals rather than fruits and flowers and so began worshipping her as the blood-drinking lion-riding fierce goddess Durga. Thus, we see the great epics of India have an altogether different form in Jainism. The focus here is on Jain doctrine of ahimsa (non-violence) over war and victory. It is yet another evidence of the diversity of India. Also read: Is Buddha an avatar of Vishnu?